In recent months and years, this has been made difficult for many people in Europe because of the attacks in Paris and the incidents in Brussels. It seems that one reason for widening the chasm follows another: the Bastille Day attacks in Nice, in which 86 people were killed and 434 injured (2016); the murder of a priest in a church in Saint-Étienne-du-Rouvray (2016); the Bataclan attack, shootings and hostage taking, in which 130 people were left dead and 352 injured (2015); the attacks on tourists in Sousse in Tunisia, when 38 people were killed (2015); the Charlie Hebdo attacks (2015), the Sydney hostage crisis (2014), the murder of Lee Rigby (2013), the London Underground bombings (7 July 2005), the Bali bombing (2002), 9/11 (2001), and so on. On the other hand, imagine how Muslims perceive the intentions of Western military actions in Syria, Libya, Iraq, and so on, or how they react when Donald Trump talks about a compulsory registration of all Muslims and expelling all Syrians, or they reacted to George W Bush's use of the word ‘crusade’ in 2001. I spent Easter week last year in Cappadocia, as part of my continuing research in Patristics. It also provided an opportunity to visit Konya, one of the most holy sites for Muslims. This is the burial place of the great Sufi saint known as Rumi, and is a place of mass pilgrimage. It is the centre of the school Islam we know in the west as the Whirling Dervishes, but in the wider Islamic world it is revered as the location of the many important relics, including the beard of Muslim Prophet Muhammad. One of the noticeable changes in the Irish population today is the sizeable presence of Muslims. The 2011 census shows there almost 50,000 Muslims in Ireland today, if not more. The context of your future ministry is within a changing Ireland in which Muslims are increasingly visible and playing a role, and a changing world which, in the wake of the rise of ISIS, Arab Spring and since 9/11, needs to know how to deal with our fears about terrorism, our vulnerability, our prejudices (in the sense of pre-judging) about Islam and Muslims, and a legacy that has left many unresolved questions. In terms of violence instigated by Muslims, statistically more Muslims are killed by Muslims in Syria, Iraq, Pakistan or Nigeria each week than Christians are killed by Muslims in Europe or in the US each week. Muslims can often fear each other more than we fear them. Many mainstream Muslims fear the rigorous approach to Islam among the Wahhabis, who are supported and nurtured in Saudi Arabia, and Sunni and Shia Muslims fear each other in Iraq, the Emirates, Pakistan and Nigeria. Islam (Arabic: الإسلام; al-'islām) is a monotheistic Abrahamic faith dating to the teachings of Muhammad (ca 570-632), a 7th century Arab religious and political leader. The word Islam means ‘submission’ or the total surrender of oneself to God (Arabic: الله, Allāh). And so, an adherent of Islam is a Muslim, or ‘one who submits (to God).’ With 1.1 billion to 1.8 billion Muslims in the world, Islam is the second-largest religion in the world, after Christianity. Muslims believe that God revealed his final message to humanity through the angel Gabriel to Muhammad over a period of two decades or more in the years 610 to 632. The Qur'an mentions numerous figures considered as prophets in Islam, including Adam, Noah, Abraham, Moses and Jesus. The Qur'an names Jews and Christians as ‘People of the Book’ (ahl al-kitāb), and distinguishes them from polytheists, although Muslims believe that parts of the previously revealed scriptures, the Tawrat (Torah) and the Injil (Gospels), had become distorted – either in misinterpretation of the text, or in altering text, or both. The fundamental theological concept of Islam is tawhīd – the belief that there is only one God. 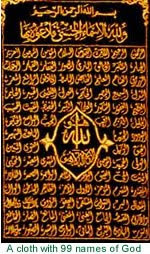 The Arabic term for God is Allāh; most scholars believe it was derived from a contraction of the words al- (the) and 'ilāh (deity, masculine form), meaning ‘the God’ (al-ilāh), but others trace its origin to the Aramaic Alāhā. Tawhīd, the first of the Five Pillars of Islam, is expressed in the shahadah (testifying), which in which every believing Muslim declares that there is no god but the God, and that Muhammad is God’s messenger or prophet. In Islam, the ‘normative’ example of Muhammad’s life is called the Sunnah (‘trodden path’). This example is preserved in traditions known as hadith (‘reports’), which recount his words, his actions, and his personal characteristics. The Sunnah is seen as crucial to guiding interpretation of the Qur'an and Muslim jurists see the hadith, or the written record of Muhammad’s life, as supplementing the Qur'an and assisting in its interpretation. Muslims are encouraged to emulate Muhammad’s actions in their daily lives. Muslims believe in the ‘Day of Resurrection,’ yawm al-Qiyāmah (also known as yawm ad-dīn, ‘Day of Judgment’ and as-sā`a, ‘the Last Hour’) that its time is preordained by God although unknown to humanity. The Qur'an emphasises bodily resurrection, and says the resurrection of dead will be followed by the gathering of humanity, culminating in judgment by God. 1, The shahadah, which is the basic creed or tenet of Islam: 'ašhadu 'al-lā ilāha illā-llāhu wa 'ašhadu 'anna muħammadan rasūlu-llāh, or ‘I testify that there is none worthy of worship except God and I testify that Muhammad is the Messenger of God.’ This declaration of faith is the foundation for all other beliefs and practices in Islam. (Shi'a Muslims consider the shahadah to be belief and do not regard it as a separate pillar, just a belief.) Muslims repeat the shahadah in prayer, and non-Muslims wishing to convert to Islam are required to recite the creed. 3, Zakat, or almsgiving, is based on accumulated wealth, and is obligatory for all Muslims who can afford it. A fixed portion is spent to help the poor or needy, and also to assist the spread of Islam. The zakat is considered a religious obligation (as opposed to voluntary charity) that the well-off owe to the needy because their wealth is seen as a ‘trust from God’s bounty.’ The Qur'an and the hadith also suggest a Muslim give even more as an act of voluntary almsgiving (sadaqah). Many Shi'a Muslims are expected to pay an additional amount in the form of a khums tax, which they regard as a separate ritual practice. 2, Amr-Bil-Ma'rūf, the ‘enjoining to do good,’ calls on every Muslim to live a virtuous life and to encourage others to do the same. 3, Nahi-Anil-Munkar, the ‘exhortation to desist from evil,’ enjoins Muslims to refrain from vice and from evil actions and to encourage others to do the same. 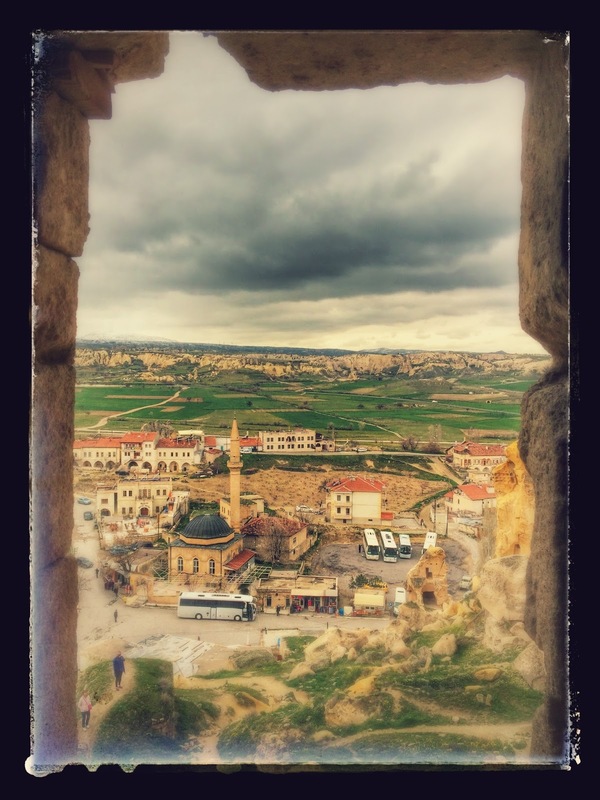 5, Do we see our lives as pilgrimages, that ‘this land is not my home, I am only travelling through?’ How do you respond to ideas such as pilgrimage and retreat? Islamic law does not distinguish between matters of ‘church’ and ‘state.’ The ulema function as both jurists and theologians. But as the Muslim world came into contact with Western secular ideals, Muslim societies responded in different ways. Turkey has been a secular state since the reforms of Atatürk, while the Iranian Revolution in 1979 replaced a mainly secular regime with an Islamic state under Ayatollah Khomeini. Many practices fall into the category of adab or Islamic etiquette, including greeting each other with as-salamu `alaykum (‘peace be unto you’), saying bismillah (‘in the name of God’) before meals, and using only the right hand for eating and drinking. Islamic hygienic practices mainly fall into the category of personal cleanliness and health, such as the circumcision of male children. Jihad means ‘to strive or struggle’ in the way of God and a small number of Muslim scholars regard it as the ‘sixth pillar of Islam.’ Jihad, in its broadest sense, is ‘exerting one’s utmost power, efforts, endeavours, or ability in contending with an object of disapprobation.’ This may be a visible enemy, the devil, or some aspects of one’s own self. But jihad also describes striving to attain religious and moral perfection. 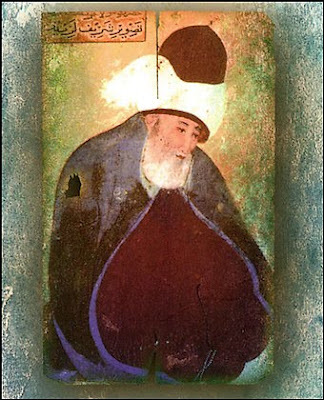 One of the leaders of ‘neo-Sufism’ in modern Turkey, Said Nursi, argued that the time of the ‘jihad of the sword’ is over, and that now is the era of the ‘jihad of the word,” meaning a reasoned attempt to propose Islam as a basis for a reconciliation of science and modern institutions with religious faith and morality. As early as 1911, Nursi argued that Muslims and ‘pious Christians’ should make common cause in defending a moral and spiritual vision of human life against the momentary illusions of consumer culture. The 20th century saw the formation of many new Islamic ‘revivalist’ movements, including the Muslim Brotherhood in Egypt and Jamaat-e-Islami in Pakistan. They see Western cultural values as a threat to Islam, and promote Islam as a comprehensive solution to every public and private question of importance. They inspired later movements such as the Taliban in Afghanistan and Osama bin Laden’s al-Qaida. Others suggest the origin is from Ašhab as-Sufā (‘Companions of the Porch’) or Ahl as-Sufā (‘People of the Porch’) – a group of devout Muslims who spent much of their time on the veranda of Mohammad’s mosque, devoted to prayer. However, the 10th century Persian historian Abū Rayhān al-Bīrūnī linked the word sūfīya with the Greek word Sophia (wisdom, especially divine wisdom). From 1200 to 1500, the ‘Classical Period’ or the ‘Golden Age’ of Sufism, there was an increase in Sufi activity throughout the Islamic world. This period is considered as. Lodges and hospices soon became not only places to house Sufi students, but also places for practicing Sufis and other mystics to stay and retreat. Sama or Sema' (Arabic ‘listening’) refers to Sufi practices that can involve the sort of music and dance associated with the “whirling dervishes.” The practice of Sufi whirling or spinning (Arabic: رقص سماع) is a twirling meditation that originated among the Turkish Sufis, and it is still practiced by the Dervishes of the Mevlevi order. 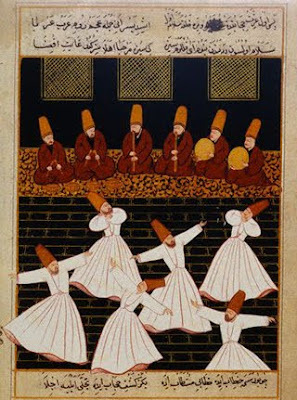 It is a symbolic ritual through which dervishes (semazens) aim to reach the ‘perfect’ (kemal). They try to desert their nafs, egos or personal bad desires by listening to their master and to Sufi music, thinking about God and whirling. In the symbolism of the Sema ritual, the semazen’s camel-hair hat (sikke) represents the tombstone of the ego. His wide, white skirt represents the ego’s shroud. By removing his black cloak, he is spiritually reborn to the truth. At the beginning of the Sema, the semazen holds his arms crosswise, to represent the number one, thus testifying to God’s unity. While whirling, his arms are open: his right arm is pointed towards the sky, ready to receive God’s blessings; his left hand, upon which his eyes are fastened, is turned towards the earth. (Divani-I Shamsi-I Tabrizi 455: A1:54, translation John Baldock). The word Allah simply means ‘The God’. The Christian composer John Tavener, who died three years ago , was commissioned by Prince Charles to write The Beautiful Names, a musical setting for the 99 Names of God drawn from the Qur'an and performed in Westminster Abbey. This eclectic work draws inspiration from several religions other than Islam and Christianity, but has provoked unease among Christians who regard it as inappropriate for performance in a Christian church. Christopher Howse, a Roman Catholic columnist in the Daily Telegraph, wrote some years ago: ‘The word Allah refers to the same God that Jews and Christians worship. There is no doubt of that. He is the God of Abraham and Isaac; the one living God. He is the God that Jesus worshipped and whom he invoked, in Aramaic, as he died on the cross, calling on him by the name Eloi.’ However, these views also drew a storm of protest. In 2006, 100 leading Islamic authorities and scholars signed an Open Letter in response to Pope Benedict XVIII’s Regensburg address. This was followed with a message from 138 Muslim leaders addressed to the Pope, the Archbishop of Canterbury, and others, calling for co-operation on the basis of the fundamental principles of love of God and neighbour, the ‘two great commandments’ recalled by Christ in Mark 12: 29-31. (Revd Canon Professor) Patrick Comerford is Lecturer in Anglicanism, Liturgy and Church History, the Church of Ireland Theological Institute, and an Adjunct Assistant Professor, the University of Dublin (Trinity College Dublin). These notes were prepared for an introduction to Islam prior to a mosque visit on 15 December 2016 as part of the Module TH8824: Liturgy, Worship and Spirituality on the MTh course. We are in the third week of Advent. Throughout this time of preparation for Christ’s coming at Christmas, I am praying each morning in Advent and using for my reflections the prayer diary of the Anglican mission agency, USPG (United Society Partners in the Gospel). 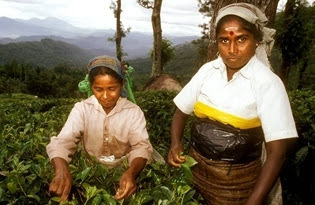 Give thanks for the church’s efforts in Sri Lanka to provide better nutrition for families living in conditions of hardship on the tea plantations. Isaiah 54: 1-10; Psalm 30: 1-5, 11-12; Luke 7: 24-30.